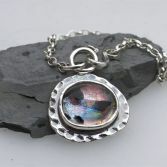 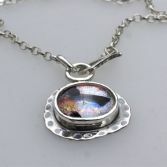 The Glass cabochon has been made using dirochic glass with sparkling ice with blues pinks and orange sparkle. 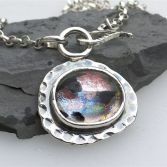 The pretty cabochon has been set into a solid sterling silver setting, organic in shape and has been oxidised blue black to show off the pretty colours. 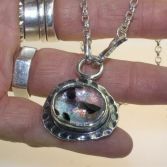 The Necklace/pendant element measures 28mm by 34mm and the Cabochon measures 20mm by 18mm and is hung on a solid chunky sterling silver belcher chain with links that measure 4mm by 3mm. 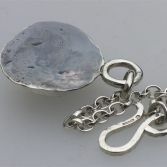 The chain is 16.5 inches long and is front fastening with handcrafted sterling silver hook. 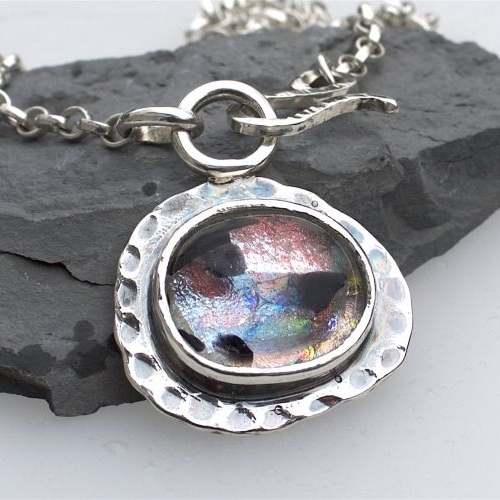 The Fire and Ice Necklace will be presented in one of my signature gift boxes and posted via Royal Mail 1st class signed for delivery to any UK address free of charge.